Most children have a specific toy or blanket that they are attached to, especially when it comes to bedtime and naps. Both my kids have their favourite blankies and I have a feeling they are going to be around for a long time, they may even be passed on to their own children one day. If you’re after a special blanket for your little babe then The Gathered Store has the perfect find. The Gathered Store is an online boutique filled with beautiful products from around the globe. Catering to those who are design minded and the young at heart, The Gathered Store belongs to two sisters who love bringing inspiring ideas to the little people in your life. Lions, tigers and bears – Oh my! 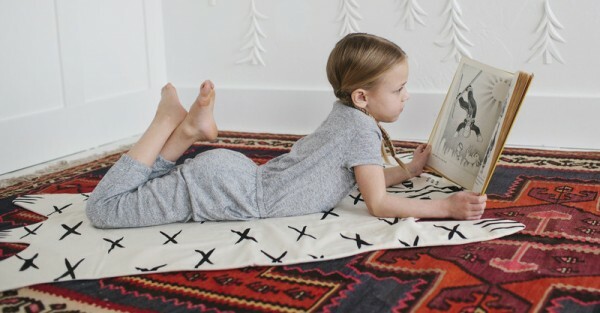 This range of lovable Heirloom Blankets by Roxy Marj will become your little one’s new best friend. Screen printed on 100 per cent cotton muslin the blankets get softer every wash, making the perfect snuggle buddy for your baby. My favourite of the three has to be the too cute for words “Heirloom Lion Blanket“. With his hairy mane he is king of the jungle and any nursery. Lucky for us the delightful trio of blankets is available in Australia, exclusively from The Gathered Store, priced at $220.